Less than six months until Windows 7 launches! Acer's European vice-president Massimo D'Angelo has revealed that Windows 7 will be shipping on Acer computers by 23 October this year - three months earlier than Microsoft's official January 2010 date. In a press conference today, with TechRadar in attendance, it was announced by Acer that the company's Aspire Z5600 all-in-one multi-touch PC (which the company called Everyone's AIO in its presentation) would be available in stores from the end of September for customers to try out. The Windows 7 revelation came when one journalist asked if he had just given the release date for Microsoft's next OS away, with D'Angelo stipulating that "he had not". He went on to say that the Windows 7-powered computer would only be available to purchase on the 23 October "and not a day before". It was confirmed also that the all-in-one PC will come on a number of formats, with either Atom, Dual Core or Quad Core processors inside, depending on which model you choose. It is likely that computers bought up to 30 days before the 23 October launch date will be eligible for a free upgrade from Vista - although that may dissuade consumers from buying Windows Vista PCs over the summer. Microsoft itself has yet to comment on the October launch date, but the company did confirm that Windows XP will continue to be available to OEM netbook manufacturers for a full year after the "general availability" of Windows 7, said a PC World story today. 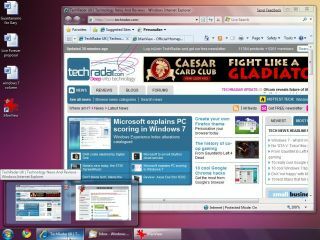 A release candidate of Windows 7 will be available for download for free from Microsoft on May 5 at www.microsoft.com/downloads. Consumers will be able to continue to use the release candidate, without charge, until June 2010.